Well, here we are. 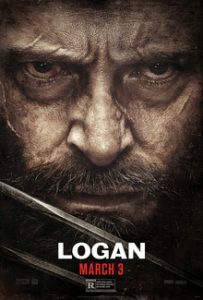 After 17 years and 9 films, Hugh Jackman has chosen to hang up the adamantium claws and retire from playing Wolverine. And what better way to go out on than in a story loosely based on Wolverine’s last ride in the comics, Old Man Logan? And with Deadpool opening the door for R-rated superhero films, finally we can get all the blood and gore associated with a hero who’s main power is knives coming out of his hands. Is Jackman’s send-off a great finale? It’s many years in the future. No mutants have been born in years, and it looks like their kind is dying off. Logan makes a meager living as a limo driver. His healing factor isn’t what it used to be, as he now takes longer to heal and it can leave nasty scars. He cares for an ailing Professor Charles Xavier, who is now prone to seizures. And being the world’s most powerful telepath, his seizures can take out dozens. And then a mysterious little girl named Laura is thrown into his life. Laura seems to have powers just like Logan’s…complete with adamantium claws. Before long, Logan, Laura, and Charles are off on one last road trip, to get Laura to safe haven, and protect her from the dark forces in pursuit. Will Logan survive this final journey? There are stellar performances all around. Jackman gives it his all in his final show as Logan. This is a Logan who’s very much near the end and is just trying to do right before it’s all over. Stewart is also good as Xavier, again, as a man who has become very broken by life. I also like the music and the overall look of the film. It’s got a very 1970s vibe to it, which is cool. We really don’t get to know who the villain is and his plot until the literal final moments of the film, so it would have been nice if we got to know him better. And as good as that R-rating is for pushing the violence, it does get somewhat gratuitous at times. May have felt my lower lip quiver a little bit as the end, as we said good-bye to Wolverine. A fitting end for the character.